Ukrainian Defense Minister Stepan Poltorak has met with Gavin Williamson, Secretary of State for Defense of Great Britain on the sidelines of the NATO summit in Brussels. "In the course of the meeting, we exchanged views on the needs of development of cooperation in the defense sphere. Our common interest is in strengthening cooperation between the Navy of both countries and the Air Force. 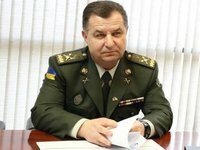 In view of the agreements already reached, there is an interest in cooperation in the field of defense procurement and defense-industrial cooperation," Poltorak wrote on Facebook on Thursday. According to him, now the British side is studying the possibility of organizing a visit to Ukraine during the celebration of the national holiday of the Independence Day of Ukraine on August 24.